It seems contrary to write a catalogue essay about an exhibition titled Silence — for this exhibition is a plea for quiet, for the removal of unnecessary visual noise. 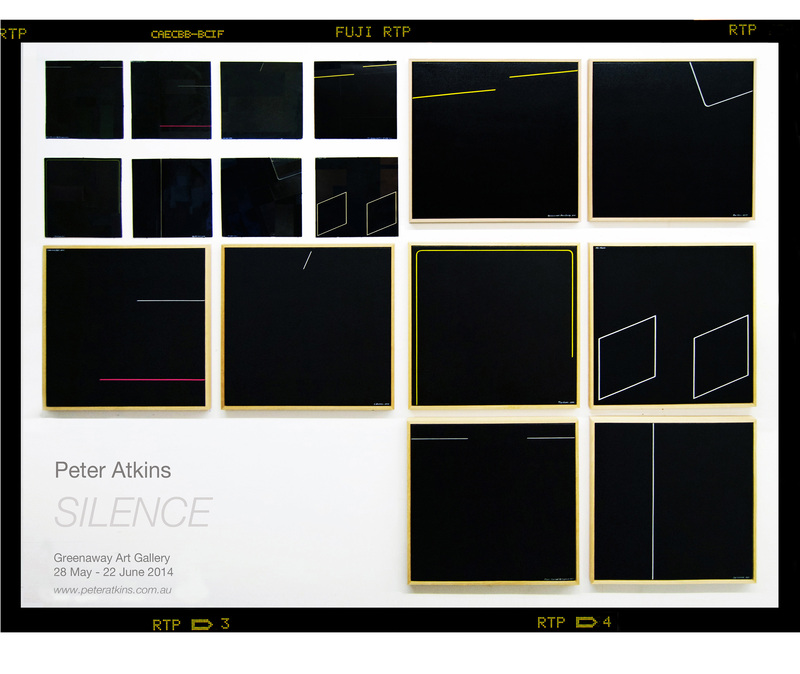 Erasure, a visual affiliate of silence, has long been a preoccupation for Peter Atkins. The starting point for his work is an encounter with an object which he then alters by removing extraneous text and visual details. It is a form of deconstruction, where the final object reveals what the artist describes as the “essential abstract elements”. The newly conceived artwork signifies something inherent to the original whilst creating a distance between the viewer and the object’s prior status as a commodity. There is often an experience of the object as something recognisable, but impossible to locate. In practice, Atkins has devised a method where the existing (but largely unconscious) collective appreciation for abstract patterning comes alive. Atkins offers an unexpected avenue for the interpretation of these found compositions. The exhibition is based on a series of record covers, united by subtle but distinctive graphic devices. The isolated forms are mostly lines; their original purpose was to frame, underline or divide the names of headline acts. Through a merciless process of blocking, Atkins has reworked the original albums, highlighting these idiosyncratic linear forms. The collages are cut and pasted with black cardboard taken from other record covers so that the final image is a luscious patchwork of blacks. These deconstructions reveal startlingly new minimal compositions. The paintings are smooth and pitch black, verging on monochromatic, with flickers of bright yellow, pink or white. They appear in stark contrast to the original covers; a garish photo of Liberace; a syrupy portrait of Cleo Lane; a bizarre assortment of lips upon microphones. The lines appear like neon lighting on the black backdrops. They are surprisingly resonant. In one instance, white and pink lines on the cover of the Romeo and Juliet album assume a symbolic association with the story. Elsewhere, a curved corner shape on a Bee Gees cover is redolent of the disco era. For people accustomed to noise, this idea of pure silence is practically inconceivable. At one point during the visit to Peter at his studio, there was a monumental shattering of glass bottles, presumably the spoils from the nearby pub. I flinched, but Peter hadn’t even registered the noise. “I didn’t even hear that”, he said, describing the extent of the ambient noise pollution in his neighbourhood. No wonder then, that the records from these sleeves go straight to the bin. Through this narrative of transformation – from album covers to paintings, the final works convey a comparative idea of silence. More broadly, they speak of a kind of quietude or modesty. These compositions are the artist’s most minimal to date.